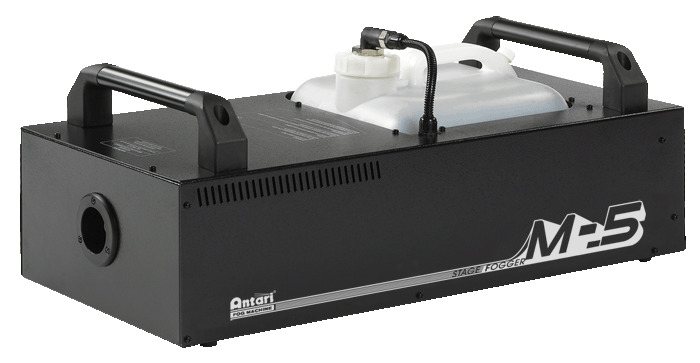 Antari M-5 Stage Foggers DJParts - All Variety of Parts that DJ Needs. 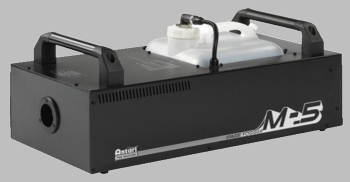 The new, high performance heavy-duty M-5 & M-10 Stage Foggers from Antari are uniquely designed to meet the rigorous demands of stage and touring use: a high-capacity 10 liter tank offers non-stop power to fog generators that enables extended use between refills. A rectangular, durable sleek housing design makes the Antari M-series Stage Foggers easy to carry and be able to stand with rigorous road transport. (Anti-shock) where custom flightcases come optional for your application. Due to its enhanced heat reservation structure, it reduces electricity consumption for about 20 ~ 25% yet producing more powerful fog. They will stand the rigors of professional use as well as protection against unexpected water spills and changing environmental conditions. (+/- 50¢J) The special pump and heater protective installation which will cut off the heater/pump power to prevent improper, unstable rising temperature. - First Heat-Up Time: 8 min.